Could GMC Really Build A Legit Jeep Wrangler Rival? 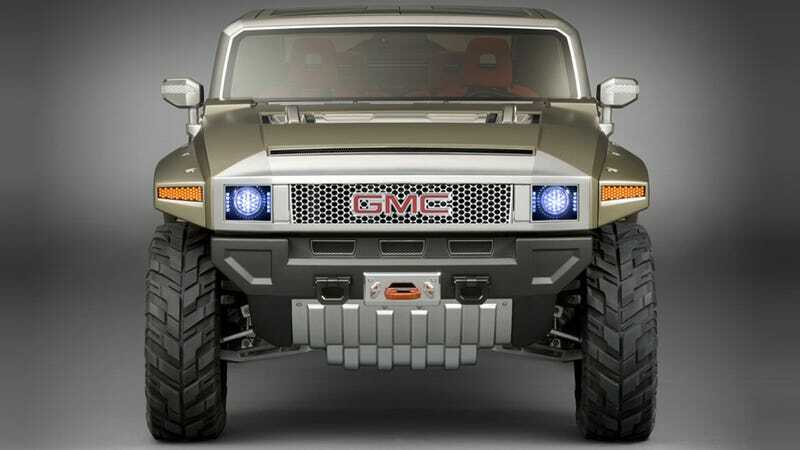 Rumors of GMC doing a Wrangler rival have been floating around for months. GM's apparently just polled dealers about whether such a vehicle would sell, but nobody at the company will admit to new product plans. Others have tried and failed to beat Jeep at making Jeeps (Toyota, Suzuki) so what would GMC need to succeed? "The move, discussed with dealers, would expand a GMC brand that is considered to be the strongest of GM's four U.S. brands. In the discussion with dealers, GM executives said the new product would borrow cues and capability from a Hummer brand that appealed to off-road enthusiasts..."
and cited "several people briefed on the matter." "There is room throughout the range if you really start segmenting it. There is plenty of room everywhere in the hierarchy," he said, going on to describe the potential for a subcompact crossover and an "active all-road, Wrangler-esque type of vehicle." Hell, Aldred was even quoted saying he'd "consider a real flagship over Yukon." But with all of GM's representatives tightlipped on the matter after that, we don't have much to go on. So let's stick to simple speculation we can work with. If GMC were to introduce something similar to a Jeep Wrangler, which I'm going to define as a purpose-built off-road recreational 4x4, what would it look like? What kind of features would it have? What would it cost? And most importantly; how would it be differentiated from the real-deal Wrangler in such a way that would actually make customers switch over?